It never ceases to amaze me how quickly political fortunes can turn around. I recall the Republican National Convention in 1996. Although the GOP couldn't bring itself to get too excited about nominating Bob Dole as its standard-bearer, the selection of Jack Kemp as his running mate did provide a brief spell of excitement. However, the euphoria was ephemeral and already a good number of activists and reporters were clamoring around the California Attorney General, Dan Lungren, and pinning hopes on him that he would emerge as a future Republican superstar. 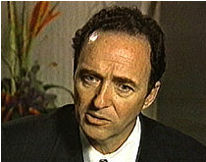 Lungren, an Irish Catholic and graduate of Notre Dame, seemed well poised to win the 1998 election for governor. This enthusiasm surrounding his then-unofficial bid was not without merit. Lungren was well known as an articulate politician who made great strides to reach out to minorities. Pro-life and in favor of tax cuts, Mr. Lungren passed the ideological test for the conservative wing of the Party. Local activists were excited about working on his prospective candidacy. In fact, prior to the convention he had even been talked up as a likely Veep nominee. National Review would label him "The Great Right Hope" in a cover story about him. But in the end, Lungren's '98 bid for governor was the most lackluster effort since, well, Bob Dole's bid for president two years earlier. 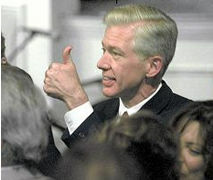 The exciting, handsome, quotable Lungren lost out to Gray Davis . . . a placid, stiff politician who epitomizes the stuffed shirt gray politician. Lungren learned the hard way that political winds can shift quickly and harshly. And as a result Davis became leader of one of the key political states in the country. Interestingly enough, Gray Davis - who, after his election, suddenly became one of the most important Democrats in the country - is now experiencing this unpleasant political reality himself. Seen as a potential Democratic nominee for president in 2004, Mr. Davis seems to be scrambling around his massive state, trying to regain his constituent's confidence. For those of you who haven't yet heard the news, California is suffering from a severe energy crisis. Many Californians have had to take flashlights to work for fear of being stuck in the dark should the power shut off in the middle of the day. And with the days of Spring coming to an end, people are bracing themselves for hot Summer days with limited use of their air-conditioning systems. This crisis, typically, has pushed Mr. Davis into hyperactivity. He is running around letting people know that, yes, there is a problem; no, it's not my fault; and the blame should all be placed at the feet of the "greedy" utility companies and former Governor Pete Wilson for pushing electricity deregulation in the 1990s. What inspiring leadership. And unfortunately for Davis, the public is not buying it. Enter William Simon, Jr. With Davis fighting for his political life, the Republicans have a fresh figure who has entered the political scene in California, and is preparing to throw his hat into the gubernatorial ring: Bill Simon, Jr. - son of the late, great William Simon. Unlike Davis, who has made a career of politics, Simon comes from the private sector. However, when it comes to politics, Simon is not a novice. Public service has been a time-honored tradition in his family. His father was made the 63rd Secretary of the Treasury in 1974. Senior also was director of the Federal Energy Office under Gerald Ford. And Bill Simon, Jr., has, despite managing the family business (which has over $3 billion dollars in assets), served as the Assistant U.S. Attorney for the Southern District of New York and as a trustee for the Heritage Foundation. A dedicated Catholic and family man, Simon has spent his free time pursuing philanthropic endeavors, much like his father before him. Founder of the Cynthia L. and William E. Simon, Jr. Foundation, Mr. Simon has expended a considerable amount of his personal resources to assist less fortunate youths through educational scholarships and beautification of California schools. Early indications show that he intends to be a highly focused political candidate. Simon has said that the energy crisis that California faces will be his number one priority. And with Davis thus far having proposed no serious solution to this problem, Simon, who made his fortune investing and making millions of dollars, just might reverse the political fortune of Gray Davis and move into the Sacramento Governor's mansion himself. After all, California has a history of electing conservative newcomers as governor. Remember Ronald Reagan?